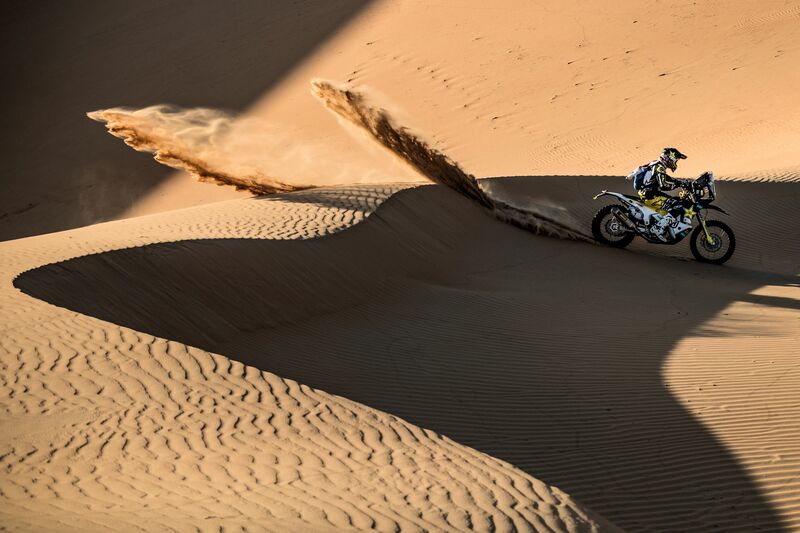 Making short work of a demanding stage four at the Abu Dhabi Desert Challenge, Rockstar Energy Husqvarna Factory Racing’s Pablo Quintanilla has secured stage victory and regained the lead in the event’s provisional overall standings. With tomorrow’s timed special featuring a motocross-styled start, the Chilean rally star is entering the fifth and final stage of the event with a lead of six minutes and 17 seconds in the provisional overall. Featuring a 244km long timed special in the dunes of the Liwa Desert, Wednesday’s stage four of the Abu Dhabi Desert Challenge was no walk in the park. The eighth rider to take the start this morning, FR 450 Rally mounted Quintanilla made the best of his advantageous position to make up for the time lost during a tough stage three yesterday. Topping two out of four stages contested so far in the United Arab Emirates, Quintanilla has put himself in the best possible position ahead of tomorrow’s final stage. Leading the overall by a little more than six minutes to Sam Sunderland and close to 10 minutes to Kevin Benavides, Pablo will look to wrap up his week-long adventure in the massive dunes of the UAE with the overall victory tomorrow. Featuring a total of 356km, the fifth and final stage at the 2018 Abu Dhabi Desert Challenge includes a 218km long timed special.